Read also our "Aperture Diary"
First we would like to introduce my friend Juergen Gulbins. Juergen is my co-author for our recent e-books on digital photography workflow. He has a strong experience in writing, technology, desktop publishing, designing high-end document archival systems and also digital photography. Juergen and me work very close together. Juergen is also producing our German books at dpunkt. Juergen uses a Mac as his primary platform while I still use mainly PCs (actually just now can switch between both systems anytime). This allows us to evaluate products from both platfoms. We don't care about the Mac/PC debate. We only want to get good resulting images and this fast. In this part 1 Juergen will describe and evaluate the gloabal functionality while I will check into the image quality issues in part 2. There is much discussion concerning Apple’s new Aperture. The application is Apple’s new ‘professional photographic workflow application’. What is so special about Aperture? In fact, you will find only a few really new features in Aperture. What is new , however, is the way Apple looks at typical tasks – nowadays called workflow – how a photographer handles his digital images. 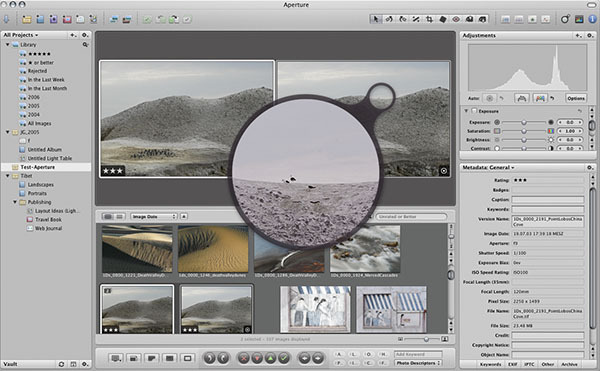 With Aperture, Apple combines the features of an image downloader, a RAW converter, an image editor, a light table, a printing application and an asset management system (image browsing, administration, retrieval and backup). While there are many applications that do part or even most of this interacting with other applications – e. g. Photoshop in conjunction with Camera Raw and Bridge – Aperture does all this in one integrated application, and does it in a way a photographer typically works – or, at least, Apple thinks he or she does. There is much praise and a lot of bashing about Aperture 1.0 on the Internet. 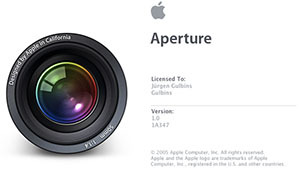 Aperture has been on the market since early December 2005 and sells for about 500 $ US (or Euro). Already street prices are dropping below $400. It demands a lot of resources – memory wise, CPU-wise and graphic-card-wise. A fast G4 or G5 processor is stated as a prerequisite, at least 1 GB of main memory, 2 GB recommended (which I recommend for Photoshop, as well). As it makes use of your graphic-card processor, you must have one of the newer graphic cards (see ) – Aperture won’t run without one of these. A test utility  is provided to verify that your system is Aperture-compatible. To work comfortably with Aperture, a highres monitor is highly recommended – two monitors are even better. As of now, only an English version is available (more language versions should come out in Q1/2006). As most applications coming from Apple, the graphic user interface (GUI) is well designed, intuitive and incorporates some new ideas. You must take time to learn to efficiently handle Aperture, as a great many functions and features are integrated into this one application. It would be nice, however, if you could increase the font size of menus and dialog boxes. Additionally, it would be helpful, if Aperture would display file name extensions. This would allow one to easily differentiate RAWs, TIFF and JPEGs using the same basic name. Reading the minimal requirements to run Aperture, you may be concerned that Aperture runs slow. This is not the case – at least not to a serious extent. Some things it does surprisingly fast – e.g. file browsing. I must be cautious in my remarks, as my system is a very fast one (a Quad-G5 with 2.5 GB of memory). You must observe carefully what it really is doing. Sometimes it does less than other applications (or, perhaps, does it more intelligently). Aperture works with JPEG, JPEG200, TIFF (some restrictions), PSD, GIF, PNG and RAW files (what it actually was designed for). The spectrum of RAW formats is somewhat restricted (see ). It can handle all images RAW, iPhoto and Apple’s Preview can handle – RAW format decoding is actually done inside Mac OS X. To support more formats, Apple will have to provide a Mac OS X update. On reading Aperture specs and seeing that Canon CR2 is supported, I was disappointed that my Canon 350D CR2 format was not (you must read the iPhoto spec to discover this). So, I tested Aperture with D70 and D100 RAW files and some RAW files obtained from Uwe Steinmueller. Though Aperture claims to support DNG, it did not open my 350D-based DNG files. Now, I am waiting for Mac OS 10.4.4 update (said to come out before Christmas 2005) and hoping this release will support my Canon EOS 350D files. In the Aperture discussion group (), I discovered a way to patch a particular Mac file. Applying the patch (plus some patches for the patch), my 350D RAW files were now supported (why couldn’t Apple do the patch in its almost weekly minor OS up-dates?). Aperture cannot properly handle CMYK files. You may import them, but as soon as you do a modification in Aperture, the file is converted to RGB. I launched Photoshop from Aperture with an RGB image and converted it to CMYK in PS. The saved image in Aperture was totally off – or, at least, the preview image was! So, if you require CMYK images for a press print, these must be done outside Aperture. It would be helpful if I could reasonably administrate those images within Aperture. Images in Lab mode will show up as ‘Unsupported Image Format’. Hopefully, both issues will be changed soon. First of all – and it is definitely welcome – Apple introduced a few new container types for images. They offer features which you probably have already tried to implement by using a strict naming discipline, via folders and symbolic links and other helpful conventions– and you most certainly failed from time to time. If you never had such problems, you probably don’t handle a lot of images. Aperture uses Projects, Folders (different from OS folders), Al-bums, Stacks and Vaults to organize photos. Additionally, there are Stacks and Libraries, Master files and Versions. A Project is a new type of container for images. You must import a photo into a ‘project’ in order to use it with Aperture. The imported files are considered as Master files and will not be modified, but kept as originals (until you explicitly delete them). You may import (download) images directly from a digital camera or card reader or from a normal folder. You may also import the content of an iPhoto library. When you apply modifications to an image using Aperture controls or filters, those modifications are stored as a modification set – usually very small (4-15 kB) compared to a master file. The result is a new Version of the file (a Version, thus, is the link to the master and modification set). If you pass an image to an external application for editing (e.g. to Photoshop), Aperture passes on a copy (TIFF or PSD) of your master. The result (saved image) will be stored as a new version of the image – it, however, is a new master (related to the original one), as well as, a new version. A Folder may be used to further structure the content of your projects. A folder may also contain images from other projects and other (sub-) folders. An Album is a logical collection of image versions – e.g. in order to group some pictures for presentation. There are three types of albums – Normal (static) Albums and Smart Albums, the latter the result of a search with specific search criteria. Additionally, there is a light table album type. This is an album in which you can freely place your pictures on a virtual light table. This light table may be larger than your screen (Aperture will scroll) and you may freely resize and stack images. A Vault is a copy of an Aperture Library for backup purposes. You may have several vaults. Aperture is able to update/synchronize your vaults (which may have been offline previously) with the original Library (a Library holds all your projects). A vault has to reside on a disk (or other kind of random access memory). You may burn it from there to DVD, yet this must be accomplished outside of Aperture. From a vault you can restore a library. A Stack is a collection of (in most cases, similar) photos. It may be used to stack several photos of the same scene or person from a shooting. You will probably use only one (the best) of these later on, but it may be helpful in a total inspection of a shoot to heap those images in one stack. Open Stack. When you close the stack, only the left-most icon is visible, indicating that the stack has 4 images. You may select one of the images as the top image (it’s called the Pick). The icon of this Pick is used as the top icon of the stack when the stack is closed. The stack has an internal order. When unfolded/opened, the images are placed from left to right corresponding to top-to-bottom order. You may demote and promote images in this stack order via buttons or keyboard shortcuts. If you have several versions of an image, those versions also form a stack. By default, the latest image becomes the Pick of the stack. You may add images to a stack and extract images from a stack. Non-destructive editing Aperture does not modify master files but stores all modifications as a separate parameter set. Thus, you may have several versions of an image (master file). This is not new in RAW converters (e. g. RawShooter offers snapshots for this task), but Apple extends this concept from RAW files to JPEGs and TIFFs, as well – it’s primarily intended to be used for files from your digital camera or scanner, but may be used for other files, as well. This, however, leads to some restrictions to image editing. There are no layers and very few selective corrections. For this reason, you may call up another image editor, like Photoshop, and a copy of your image will be passed along. The result will be taken back by Aperture and is handled as a new version of the image. Library Everything (projects, folders, albums, …) is kept in a Library. The Library is the database and container for Aperture objects – it’s the Aperture universe. From the view of the standard Mac OS finder, an Aperture library is a huge file (actually as a package). Individual objects (images, folders, albums) are accessible easily only via Aperture – you must export these objects to make them accessible to the finder or other applications. Note: The Aperture library is actually a package that can be used by using “Show Package Contents”. You then can browse the library like normal folders. The workflow using Aperture is optimized for photographers. You create a new project (or open an existing one) and import new images either selectively or all from a memory card or camera. Importing implies that files are copied into the Aperture Library. You may import directly from the camera, a card reader, a disk folder or import an iPhoto library. You may next create a Vault on an external disk as a backup before deleting the photos from the camera or memory card. At this point, you will probably want to inspect your new images (heaping up similar images using Stacks makes room in your filmstrip window), assign priorities (1 to 5 stars plus Reject) to your images and start to sort out images not good enough (most of these features are offered by other RAW converters, as well, (e.g. Bridge/ACR, Capture One or RawShooter). There are buttons to increase and decrease your ratings. You may add keywords and other metadata – to a single image or to several images via a simple batch. You may also attach a classification to images (like People, Wedding – you edit these terms and add your own terms). This classification may be used for sorting and searching. You may Lift metadata and Stamp it onto other images. Now, you begin to optimize single images. Every good RAW converter can do this. The Loupe (flexible magnification glass) and the possibility of viewing several images side-by-side is a nice feature other RAW converters might copy. Versions – several variations of the same master file – is convenient (in RawShooter implemented via Snapshots). 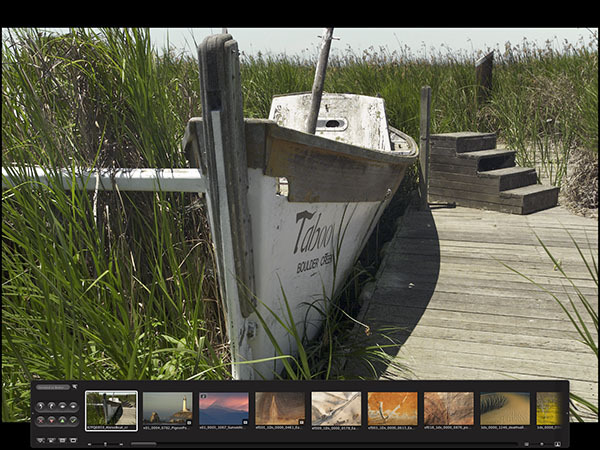 For web galleries, Aperture editing will be sufficient in most cases. For a perfect print, you must frequently move to Photoshop for those optimizations Aperture cannot offer – e.g. selective color, tonal and contrast enhancements using layers and layer masks. Photoshop will return the edited image, and Aperture will store it as a new master version, related to the original master. You may also edit an image using Aperture. It offers most controls and operations other RAW converters offer – though Aperture allows performing them on TIFFs and JPEGs, as well , in a non-destructive way. There is White Balance (color Temperature and Tint), Exposure compensation, Saturation Brightness and Contrast. You will find Levels and can set the Black point, the White point and your Gray point. Curves is missing! 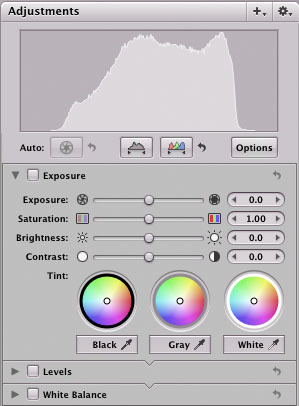 The histogram displays either luminance or color channels, selectable from the Adjustments Action popup menu. What I missed is a RGB readout, showing the RGB values below the eye dropper. There is a also overexposure warning: View>Highlight Hot Areas (Alt/Option-Shift-H). As with most modern RAW converters, there is also a tool for Noise Reduction and also one for Sharpening. Both provide basic functions but are not up-to-date with the more advanced filters available today – e.g. 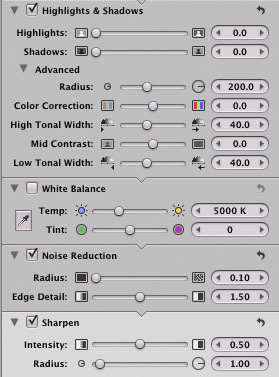 no threshold slider in the sharpening filter and you may not do noise reduction on individual color channels. Being in the trend, you also find a Highlight and Shadows tool. What is absent are corrections for chromatic aberrations, vignetting and lens distortions. Aperture provides a Cropping and a Straighten Tool. It even allows Red Eye Removal and has a Spot and Patch Tool – both also for RAW files, not yet found in many other RAW converters. The latter tools however, are not as sophisticated as those in Photoshop. 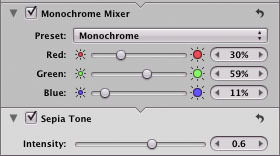 There is also a Monochrome Mixer providing several color filters in its drop-down menu. There is an additional control for sepia toning. To keep the Adjustments palette at bay – Aperture calls these palettes HUDs (Heads-up Displays) – you may add/activate and deactivate/hide most of these adjustment sliders as part of the Adjustment HUD. The Lift tool lets you ‘lift’ settings from one image and apply them to other images. Having done several corrections, however, you cannot lift individual corrections but only all. There is an Undo operation for most corrections and modifications. Apart from Projects, there are many more ways to further structure your image sets – inside a project and across projects. You may use folders and albums. Both may have elements from several projects (e.g. a album may hold all the best shots of a year or all images of a customer or just the final selection for a presentation). Using Folders for special collections is yet another way. In the project browser window of Aperture, the different types of containers use different colored icons. This helps in following an overview. When you duplicate a master, edit an image using Photoshop or another editor, open or close a stack, you normally do it from the icon list (or filmstrip). It is most annoying that after this operation the position in the list jumps and you must scroll down once again to your working area. With some images, we saw a severe color difference between the icon in the film strip and the image preview in the adjustment window – the latter, sometimes, much to dark. This occurred using TIFFs with a deactivated alpha channel. When these images were opened in Photoshop, the copy passed to Photoshop was too dark, as well – obviously a real bug (Aperture does not recognize that the alpha channel has been deactivated). The workspace (your Aperture screen) is very adaptable. There are five basic modes (from left to right: Viewer mode (Pull-down menu with several variations), Zoom Viewer, Show Master Image, Full Screen, Toggle Primary only). You may further hide or display single parts of the basic window. As with Bridge and most modern RAW browsers, you may control the size of your preview icons. You may select images and create a Web Gallery, a Web Journal or a Slide Show or call up Mail and attach selected (scaled down and converted to JPEG) images. For the Web Gallery, Web Journal and Slide show, there are more parameters and styles to set than you would expect from a first version of a software application. A Web Journal is a kind of Web Gallery that is more flexible for free place-met of images and additional text blocks. You may also order prints (Apple has affiliations with some photo services) or produce a Book (which will also be printed by a service provider). For both of these, you will need an Apple account. These are functions, consumer electronic albums (e. g. Adobe Album, Adobe Photoshop Elements or Apple’s iPhoto) offer nowadays. More important may be the option to export a Master or Version, as this is a handy way to export from Aperture. Not described in the Aperture manual, you may also navigate inside an Aperture Library using the Finder. By default, you will find the Library under ~/.Pictures/Aperture Library.aplibrary (~ is your user home directory). Select the library, right-click your mouse and select Show package content from the drop down menu. This will open the Library like a folder. Here, you may use the procedure for objects like projects or albums. Naturally, you may make a print. 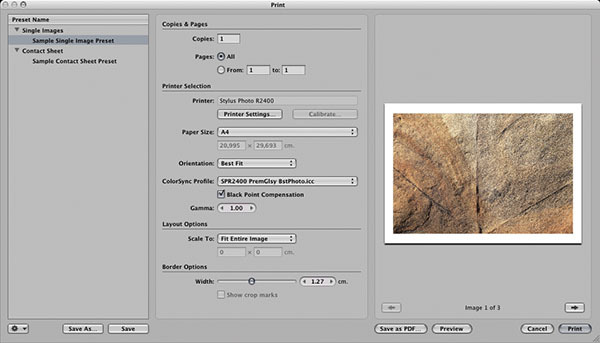 Aperture offers most settings important for printing – e. g. selecting the correct profile for printer + ink + paper + driver settings with color management handled by Aperture (actually it is done by ColorSync). What is missing, however, is the rendering intent setting – at least, I could not find it, and which I deem unprofessional. You may either print images to a contact sheet (lots of options for this) or print single images. And you may save your settings. For most often-used operations, there are keyboard shortcuts, to speed up your work considerably. Though my experience with Aperture is still quite limited, I ’d like to summarize my conclusions. What is missing in this introduction is a statement on the quality of RAW conversion. I just didn’t convert enough RAW images to give a meaningful statement on this. This will be done by Uwe Steinmueller in another report. As of this writing, Aperture is very new (hardly a month out). It offers some new functionality. Every maker of a RAW converter, image browser, asset management system or image editor for photography should take a very close look. It is extremely resource hungry (actually designed for the next generation of PCs. Something Steve Jobs has done before). Aperture retains some severe deficiencies, e.g. speed when applying several corrections/filters in RAW conversion quality or when stamping lifted metadata or settings to several images. Noise in dark areas (RAW images) seem to be much stronger than we Adobe Camera Raw, RawShooter or Capture One. It will definitely take Apple some time to rectify all shortcomings. Some of their design decisions may not be the best ones (e.g. embedding basic RAW conversion into the operating system – though Microsoft may do this soon, as well). Aperture will not replace Photoshop in the near future, and Apple may be well advised not to try this for some time. You are well advised to test Aperture thoroughly before embedding your images into the (rather) closed Aperture environment. Maintaining some projects inside and others outside of Aperture may be a good idea for some time. Aperture’s RAW converter is likely not the best there is, though some users claim to be quite satisfied. Conversion quality may vary from camera type to camera type and probably from image type to image type (actually, there is no single RAW converter to satisfy all users). A weakness seems to lay in dark areas, where you tend to find stronger noise than with some other good RAW converters. Also gradients seem to be less smooth. Professional photographers deem image quality as extremely import. For the prosumer market, Apple will have to broaden the spectrum of supported cameras and file formats and may have to reduce the price. What I really miss, is a way to make a vault of an individual project – vaults currently are backups of the whole Aperture Library. You may do your own project backup, using the finder as described above. You will be very careful not invalidate Aperture’s database when you restore a project this way – Aperture will not be able to do synchronization this way! I consider the closed aspect of Aperture is a real serious problem. When starting to use Aperture, I would wish to bring all my images into the program. I can’t do this with my older RAW images (their format is not supported); I can’t adequately handle my CMYK images in Aperture (I need them for press printing), I can’t handle my LAB mode images. My image work space grows from a single disk, and you must trick Aperture to handle this – an Aperture library is one large file. The same is true for backup vaults. As of version 1.0, Aperture can’t handle offline media – you cannot off-load the images in a project to an offline media, delete the images and still keep the administration (preview icons and metadata) in your Aperture database. Apple will be well advised to improve integration with Bridge and Photoshop. In the Apple Aperture forum , there is a hot discussion going on as to whether using Aperture in conjunction with Adobe Camera Raw makes sense or not. It may be asking too much from the first version of Aperture. But Apple is entering a maturing market with much competition. It did a lot of integration into one application. Still, it really should quickly improve several functions and also open up the Aperture universe to other applications and parties. There is no plug-in architecture as far as I know. Such a thing might help increase productivity using third-party filters and other plug-ins and give Apple more time to improve its critical tools. If this summary sound mainly skeptical, this would not really give my feelings about Aperture. There are many very nice features I found – e.g. that you may use the loupe not only on the preview image but also on the thumbnails. I liked very much that you can structure your photos using projects, folders and albums. I like the light table albums, the clear and appealing GUI, the many keyboard shortcut there are and much more. I saw really few applications having the same maturity as Aperture in version 1 (one may be RawShooter). So, let’s hope Apple will listen to the critics carefully and react soon. Apple may not have much time until Microsoft comes out with a similar application and I am very interested what Adobe’s answer to Aperture will be.